Today is an important day for the future of Plantcatching; an update that transforms it into a powerful plant-sharing search engine. So far, this platform has always encouraged sharing and the development of networks between local gardeners and will definitely continue to do so. However, there are two categories of people who would like to join the movement (but haven’t yet) and start sharing plants: those who live in sparsely populated areas, and those who want to make exchanges by mail. A page to build a list of plants that are available for the taking and a list of plants that are sought-after. These lists don’t replace the usual plant listings. Their purpose is to facilitate mail exchanges and to allow people to create a great big list of plants instead of making a separate ad for each variety. 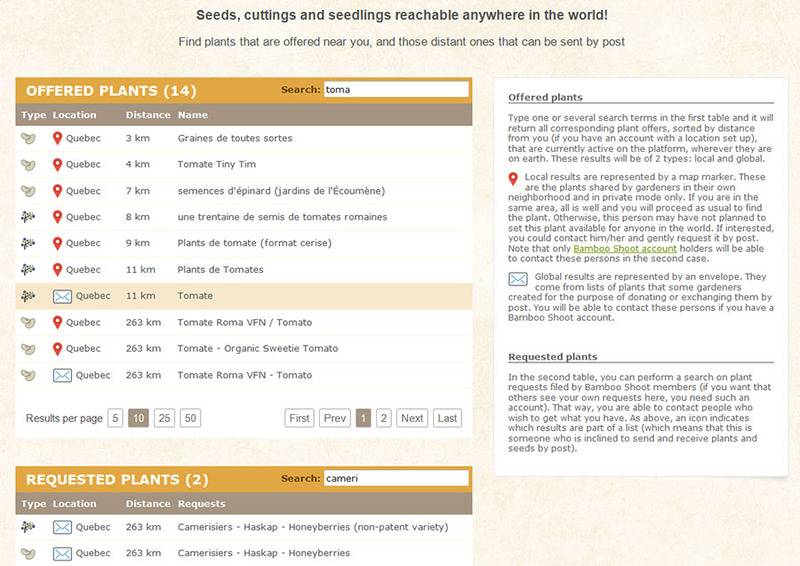 The search page allows you to find by whom and where a specific plant is on offer or wanted. In both cases, it also makes it clear which ones are nearby and which ones are far and require an exchange by mail. Searching with keywords is a very powerful functionality that goes beyond the basic services offered by the citizen platform that is Plantcatching. It has the potential to address many needs worldwide and will express the true nature of the Plantcatching platform: solidarity between gardeners helping each other locally and across great distances. When doing a search, the distant listings or those requiring mail exchanges will only be made available to users with a Bamboo shoot account. Because the number of professionals who support Plantcatching is still relatively low, my aim is to encourage many more people, including a new category of passionate gardeners, to financially support the future of the Plantcatching project. To put it plainly: without your support, Plantcatching will simply not live on. If I can keep it going, new developments will then become possible: a mobile-friendly website, for example, which has been requested by many of you. Please note that regular users (non-Bamboo account holders) are not left behind. They can also use the new search engine right now instead of having to scrounge around in the map listings. I’m inviting you to become Bamboo Shoots today in order to have access to advanced search features and also to save Plantcatching outright. This is your platform. Its future depends on you. Think about what 20$/year will get you in terms of plants, seeds, tools and materials you’ll be able to get for free from Plantcatching members! You can also keep your regular account if you like it the way it is, and make a good ol’ donation. Just $5, $10 $15 or even more will make a huge difference. 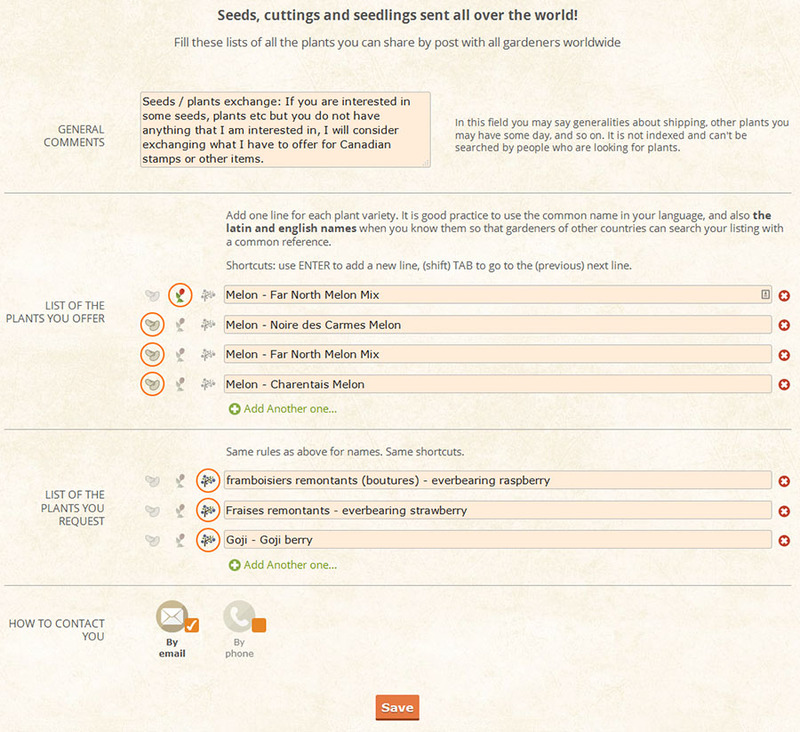 Plantcatching already has 3000 registered members (+ non-registered members). Imagine having Plantcatching right on your mobile phone and tablet! I really want to keep Plantcatching affordable and citizen-friendly, but the situation has reached a critical level.